The front gate opens onto 5 miles of unspoilt sandy beach, backed by dunes, heathland and marsh. 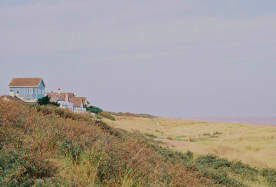 A 250 yard walk along the beach takes you to a bird hide in the dunes, overlooking the Anderby Marsh nature reserve. The Seahouse ( holiday cottage - house ) to rent is an ideal family holiday home with 3 bedrooms, a lounge/dining room, two bathrooms, a well equipped kitchen and two conservatories. A summer house in the garden provides a quiet retreat and furnished decks, facing the sea and the Lincolnshire Wolds, allow you to chase the sun throughout the day. There is parking for two cars. Although quiet and unspoilt, Anderby Creek has a licensed beachside cafe, a pub, two restaurants, a laundrette, a village store and a fishing lake. There is a golf course and equestrian centre at Sandilands, 3 miles away.